1.translate each other in 34 languages: English; French; German; Spanish; Italian; Portuguese; Arabic; Polish; Turkish; Czech; Dutch; Catalan; Hungarian; Hebrew; Croatian; Slovak; Greek; Hindi; Norwegian; Swedish; Danish; Finnish; Ukrainian; Romanian; Russian; Malay; Indonesian; Vietnamese; Chinese, Chinese(Traditional); Cantonese; Japanese; Korean; Thai. 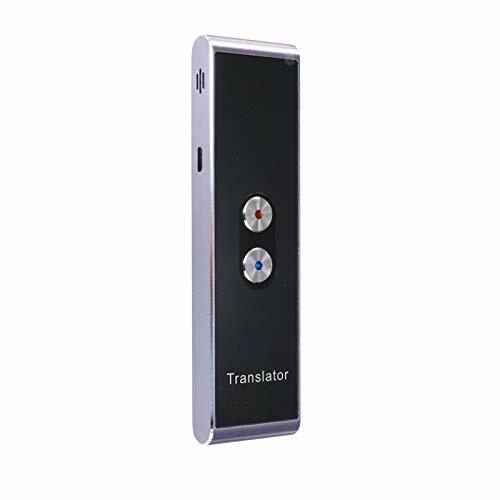 2.easy to operate the real time translation: install the app "global translator", and open it; connect the translator with your smart phone via bluetooth; push the button, hold it till finished your speech; the translator will speak out in target language, also you can see the text and replay. 4.Built in pocket size, easy to use and store. 5.Application: travelling abroad; language learning; international business meeting, etc. 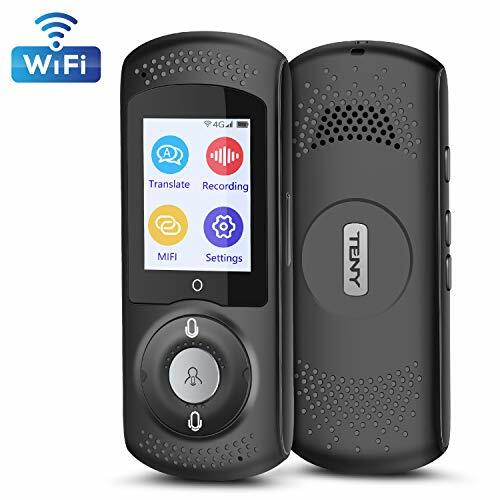 T8 Handheld Pocket Smart Voice Translator Device Electronic Pocket Voice Real Time Speech Translation via bluetooth , WIFI, Network connect. Huge Statements: More than 50 million daily and travel scene expressions. Intelligent Scene Recognition. Your voice translate officer. 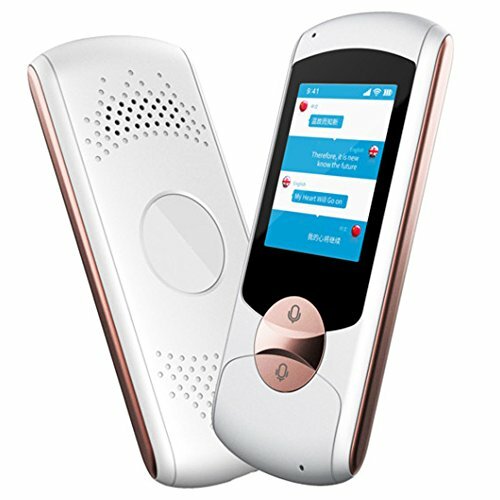 Multi-functional design: Microphone, Power on/off, previouse/volume up, Next/olume done, Indicator lights, Record language A, Record language B.
Multilanguage?Support: Support more than 33 different languages real time inter-translate: English, Chinese, Arabic, Spanish, Portuguese,French, Japanese etc. Portable Design: Small handheld design, easy to carry. super long working time. your perfect tool for language learning, global traveling, shopping abroad, business translation etc. 3 MODES WITH APP: World's first AI-powered translation system implementing 3 modes to break language barriers. Auto Mode: Allows for absolutely hands-free and natural conversation, encouraging people to communicate with others. Touch Mode: Touch to speak and then release to translate. Speak Mode: 1 Earphone + 1 Mobile phone enables conversations for more than 2 people. 3 modes were designed for different scenarios. 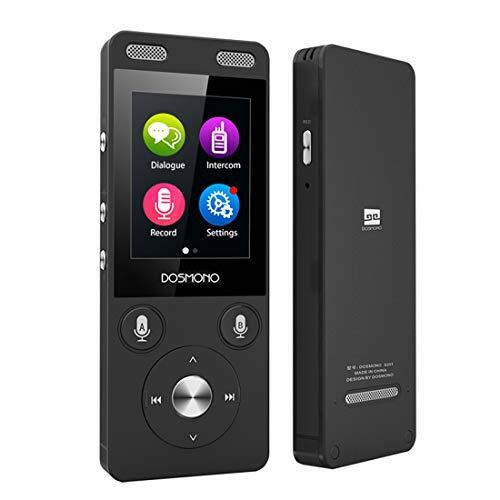 It is perfect for traveling, language learning and business communication. 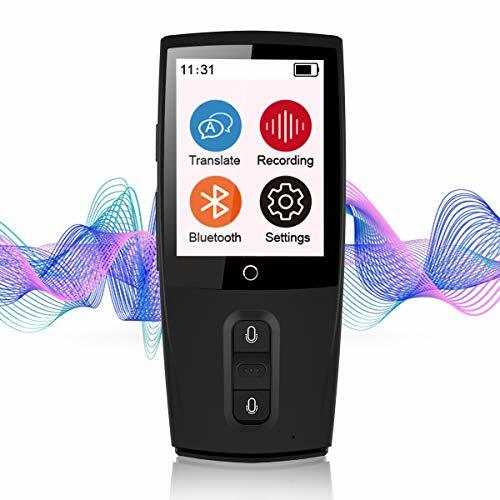 95% ACCURACY & REAL TIME TRANSLATION: WT2 Plus language translator has 95% ultra-high translation accuracy for daily usage. WT2 has acquired strong external technical support from Google, Microsoft and Tencent AI Lab. Industry-leading AI algorithm enables real-time translation in complex and challenging environments. 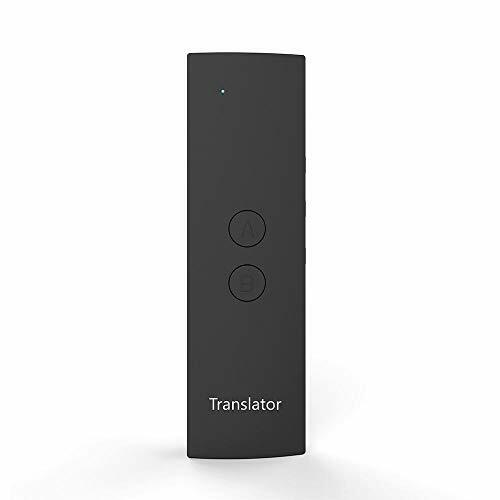 With auto voice detection and auto pick up, WT2 Plus delivers an immersive translation experience. 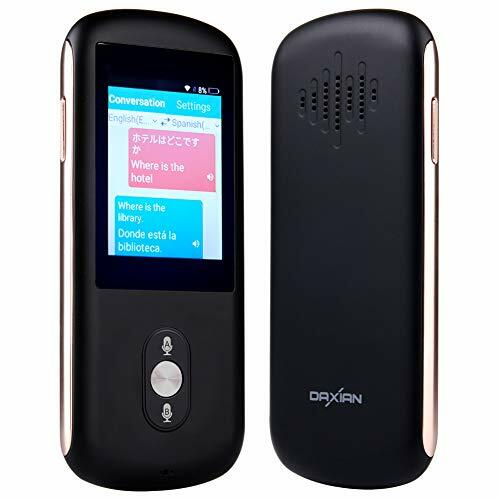 2-Way Real Time Translation: This voice translator can be used to communicate face to face, and solve communication obstacles, quick reaction accurate recognition and give you the most suitable translation results in real time. 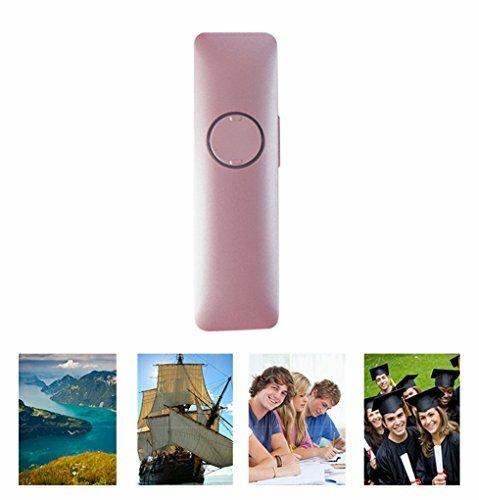 Bluetooth wireless connection, connect to your phone via Bluetooth, allows wireless transmission distance up to 8m. 1s fast translation, powerful online translation, make communication easier. 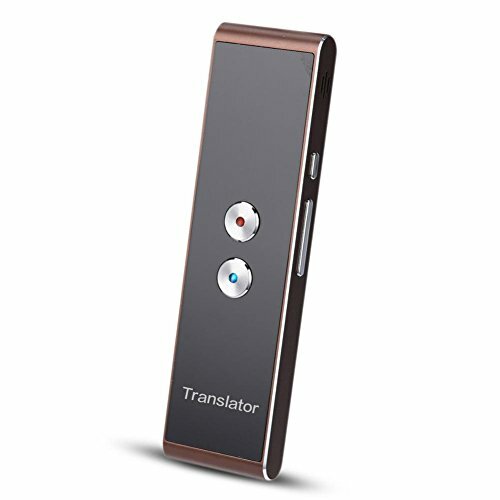 41-Language Translator Device: Support 41 Language Mutual translation, English, Uighur, Korean, Japanese, Thai, Vietnamese, Chinese,Spanish, French, Italian, German, Russian, Portuguese, Arabic, Dutch, Greek, Polish, Danish, Dutch, Czech Language, Romanian, Swedish, Hungarian and so on. 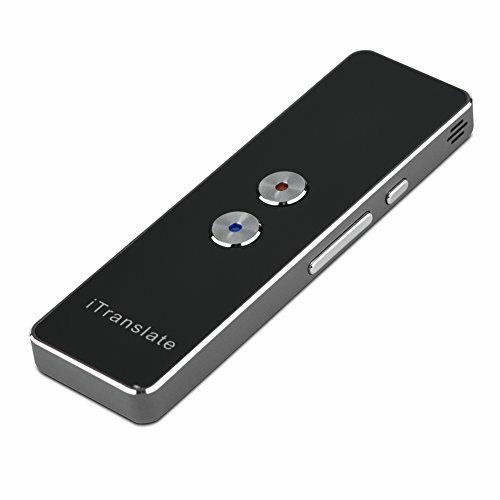 Wide Compatibility: This translator device compatible with most iOS and Android phones. Built-in 3.7V 850mA rechargeable battery, low power consumption, plug and easily charge. Support Multiple Languages Translation: More than 30 languages for the option. English, Chinese, German, Korean, Japanese, Thai, French, Spanish, Italian, Dutch, Greek, Portuguese, Russian, Arabic, Swedish, Czech, Finnish, Danish, Polish, Hungarian, Romanian etc. Small and exquisite: 123 x 36 x 12 mm / 4.8 x 1.4 x 0.5 inch size. So comfortable to carry wherever you go. 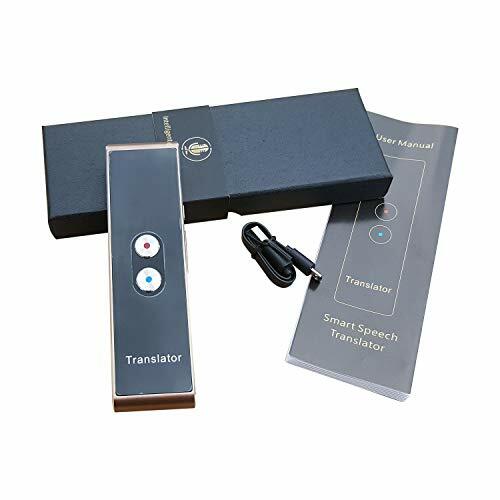 Real-time bidirectional intercom: can be used to communicate face-to-face and resolve communication barriers to give you the best translation results in real time and a quick response in seconds. Easy to use: simply press the "A" button and start speaking. Then release the key to automatically translate your language to the "B" language. 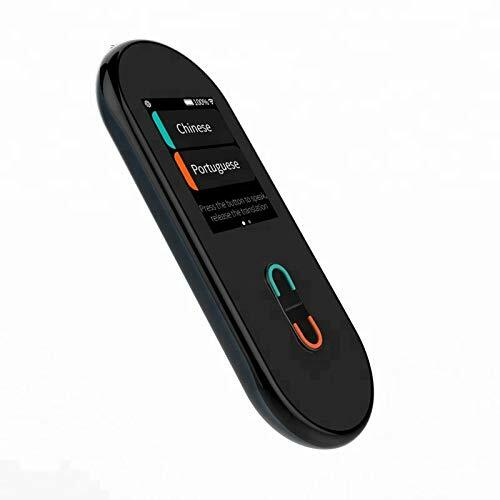 Bluetooth wireless connection: Connects to your phone via Bluetooth, allows wireless transmission distance up to 10 meters, and the voice recognition distance is 2 meters. ✔【Language】Chinese(Simplified/ Traditional/ Cantonese), English(US/ UK/ Australia/ India), Korean, Japanese, French(France/ Canada), German, Spanish(Spain/ Mexico), Thai, Italian, Dutch, Greek, Portuguese(Portugal/ Brazil), Russian, Arabic(Egypt/ Saudi Arabia /International), Hungarian, Swedish, Czech, Finnish, Danish, Polish. 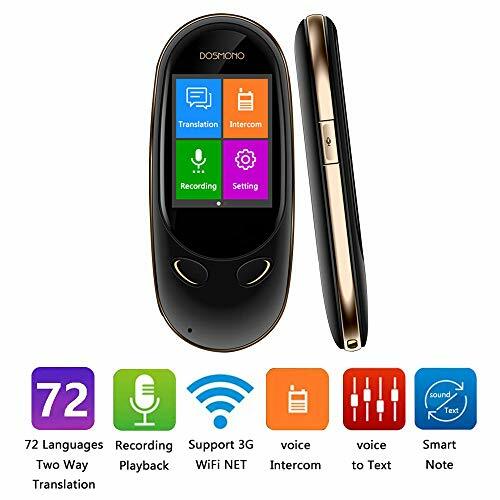 ✔【2-way Instant Translator】2.4G wireless connection, supports 2-way language translation, designed for language learner, businessmen, tourists, sojourners, etc. ✔【Easy Operation】Scan the code on the manual and download the app, install it on your Android/ IOS mobile phone, then start to use it. The device must work with the app. 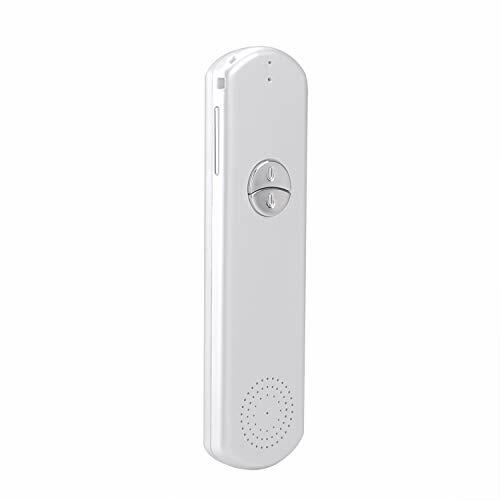 ✔【High Recognition Ability & Accuracy】Built-in dual microphone, one is for voice sensing and the other one is for denoising. 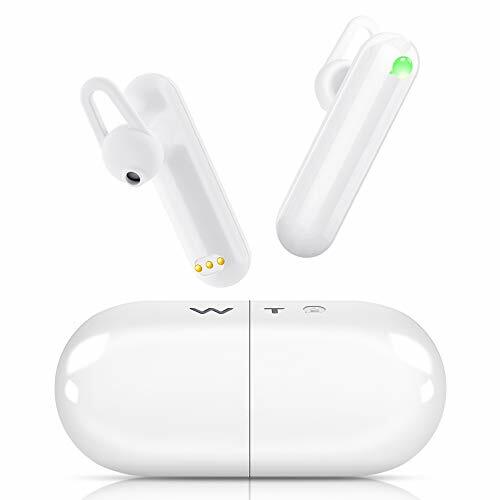 In-ear detection function: the earphone is put into the ear, the music starts to play automatically, and the earphone is taken out from the ear, then the music is paused. 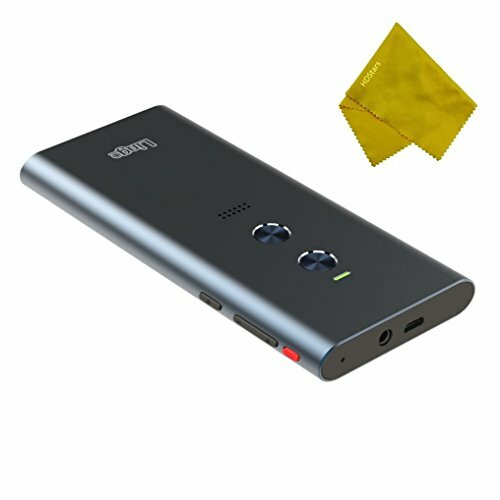 Translation results voice release function: Put the headset into the charging box, then translation results can be released through the charging box. Multiple Languages Translation: Support up to 19 languages translation, such as (Chinese) Simplified Chinese, (Hong Kong, China) Chinese, (Taiwan) Chinese, (US) English, (UK) English, (Australian) English, (Canada) English, (Indian) English, (Egyptian) Arabic, German , Spanish, (Mexico) Spanish, (Canada) French, (France) French, Italian, Japanese, (Brazil) Portuguese, (Portugal) Portuguese, Russian. Speak to the earphone, then it will translate into the voice of the country you want. 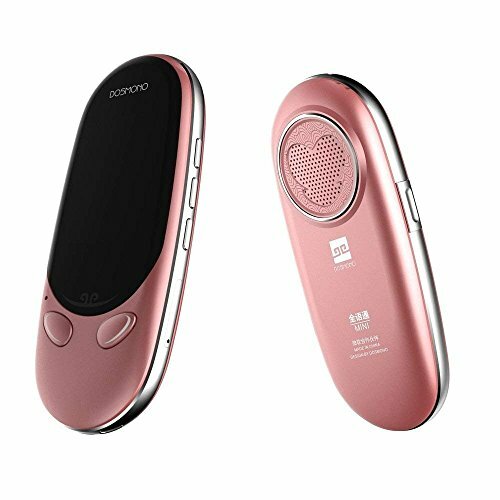 【2-way voice translator】Support 2-way translation: Chinese(Mandarin,simplified), Chinese(HongKong SAR), Chinese(Mandarin,Taiwanese), English(United States), English(United Kingdom), English(Australia), English(Canada), English(India), Arabic(Egypt), German(Germany), Spanish(Spain), Spanish(Mexico), French(Canada), French(France), Italian(Italy), Japanese(Japan), Korean(Korea), Portuguese(Brazil), Portuguese(Portugal), Russian(Russia). 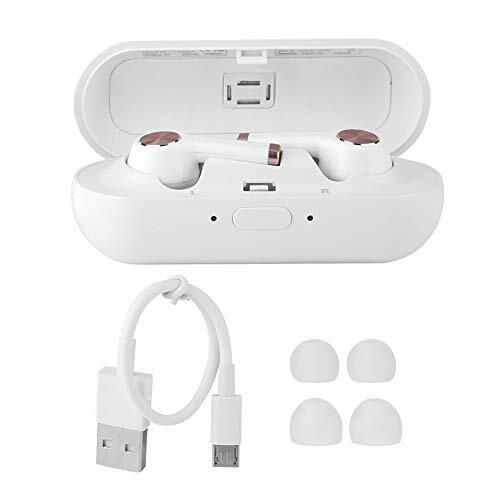 【Super Stereo Earbuds 】Both earbuds of the smart language translator have build-in chipset for switch phone, support answer the phone call and play music. Please read the user manual carefully. 【Easy Operation 】Scan the code on the manual and download the app "Dolphin Translator", install it on your Android/ IOS mobile phone, as long as your phone can surf the internet, then start to use it. The device must work with the app. 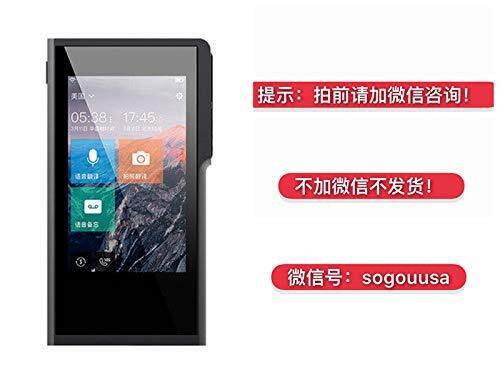 【High recognition ability】 This smart language translator is accurate and fast translation, widely apply in travel, hotel consultation, order, communicate, studying, communicate without difficulty. 【We do our best 】 We support our best service,high quality products and 12 months warranty. If you have any questions with our product,pls do not hesitate to contact us,we will try our best to help you and reply within 24hours. 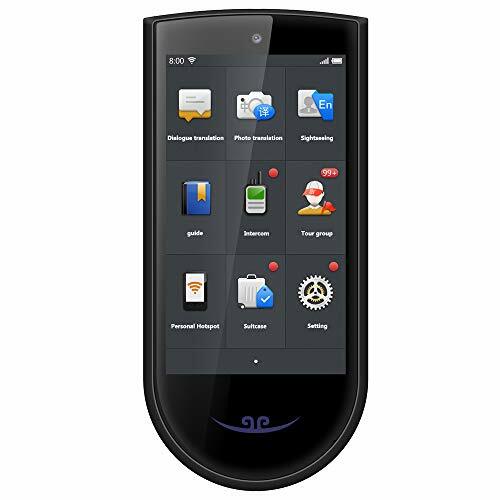 The device is used independently,there's no need to install any App, it can be used directly. It can be used via connected to a WIFI network. The hotspot shared from your smartphone also works well. 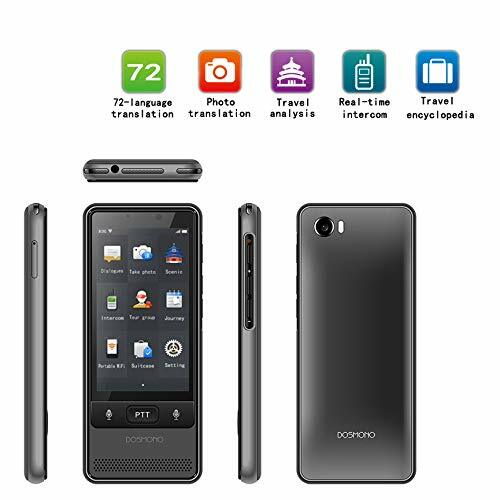 It is suitable for learning,business,shopping,travelling,making foreign friends and etc. Novel appearance and comfortable wearing.Compatible with for Android, IOS operating system. 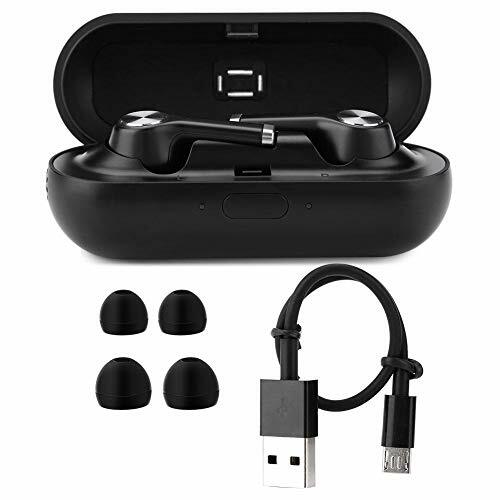 Use Bluetooth 5.0 wireless link to meet different device connections, freely control within 10 meters. Support multi-person simultaneous online translation.Provide real-time simultaneous interpretation of voice in 28 countries. Novel appearance and comfortable wearing. Compatible with for Android, IOS operating system. 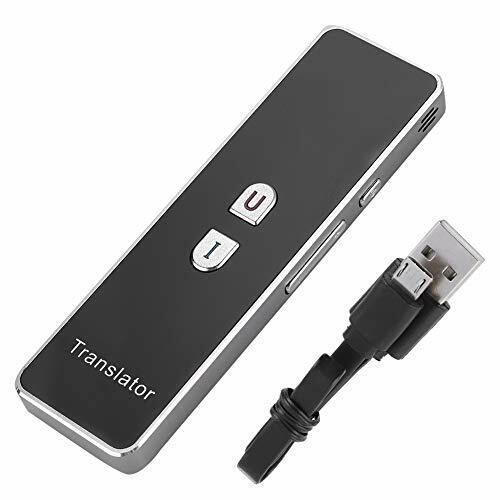 Support A2DP, HFP mode.Support multi-person simultaneous online translation. 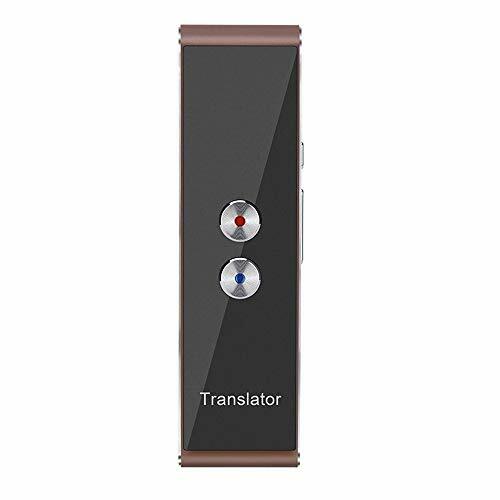 【FAST AND INSTANT REAL TIME TRANSLATION】TWO-WAY TRANSLATION WITH 37 LANAGUAGES UNDER WIFI OR MOBIEL HOTSPOT CONNECTION ensures smooth non-interrupted conversation between people who speaks different language. Significant problem solving for communication, language learning, travel, business and more. 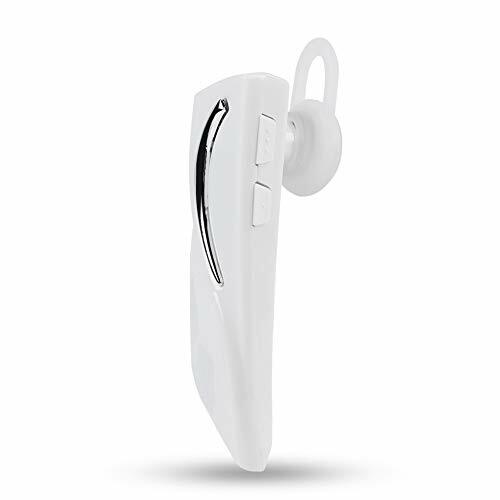 【HIGHLY SENSITIVE VOICE/LANAGUAGE RECOGNITION TECHNOLOGY】 NEWEST NOISE CANCELLING TECHNOLOGY enables the device to recognize human voice efficiently even under noising environment. 【TRANSLATE BETWEEN 53 LANGUAGES】Arabic,Catalan,Czech,Korean,German,Chinese-CN, Canoness ,Danish,Dutch,Greek,English-Australia,English-British,English India,English,Finnish,Italian,Japanese,Hebrew,French-CA,French,Hindi,Hungarian,Indonesian, Norwegian,Polish,Romanian,Russian,Portuguese-BR,Portuguese,Slovak,Spain-SA,Spanish,Swedish,Thai,Malayu,Turkish,Vietnamese and MORE! ✔4. 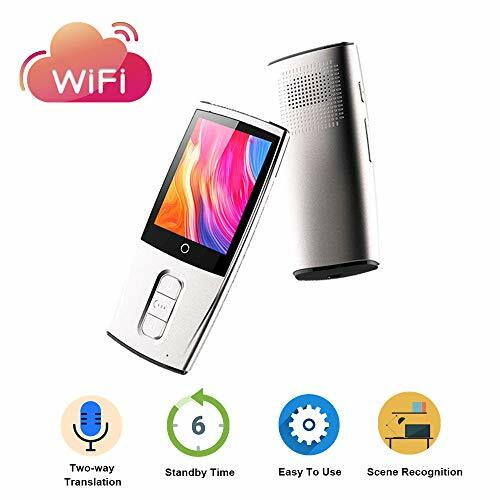 WiFi & 4G SIM Internet: You can use the the electronic translator not only with wifi, but also 4G GPRS card; at the same time, it support one key wifi hotspot,you can use the translator as portable wifh hotspot for your smartphone, tablet PC etc. 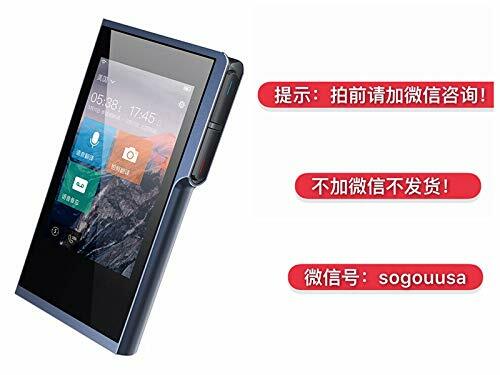 This machine is equipped with Android 6.0 system, built-in 2000mah rechargeable battery, support GPS and recording, front camera 500W, rear 800W, support network: mobile 4G, Unicom 4G and WIFI, equipped with 3.5-inch WQVGA display, audio output is 3.5 Mm headphone jack, body memory 4.31G. The machine has independent translation function, no need use a translation App. ❤【Real Time Instant Translation:】Support 39 Language Mutual translation,The translator responds with 99% accuracy.English,Chinese,Korean,Japanese,Thai,French,German,Dutch,Greek,Portuguese etc. 【Do our best 】 We support our best service,high quality products and 12 months warranty. If you have any questions with our product,pls do not hesitate to contact us,we will try our best to help you and reply within 24hours. 【20 LANGUAGES + 19 ACCENTS】Simultaneous 2-way translation in multiple languages: Arabic, Catalan, Chinese, Danish, Dutch, English, French, Finnish, German, Hindi, Italian, Japanese, Korean, Norwegian, Polish, Portuguese, Russian, Spanish, Swedish, Thai. 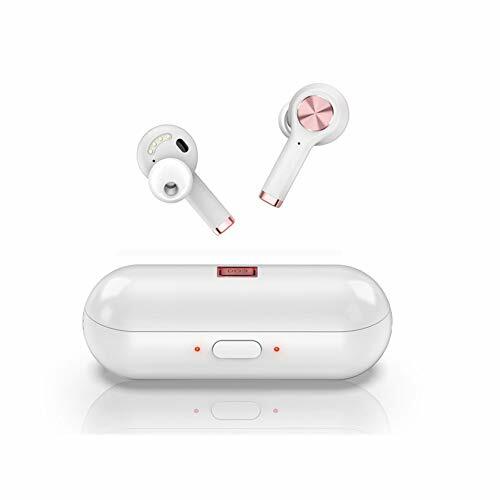 【Super Stereo Earbuds 】Designed to comfortably fit in your ear: Both bluetooth earbuds of language translator device have build-in high-quality chipset for iphone, they are light and comfortable to wear for long hours with no painsupport. Support answer the phone call and play music. 【Easy Operation 】Scan the code on the manual and download the app "Dolphin Translator", install it in your iphone, connect the bluetooth earbuds to your iphone, as long as your iphone can surf the internet, then start to use the language translator device. The translator device needs to work with the app. Notice: Please change the default setting language to English. 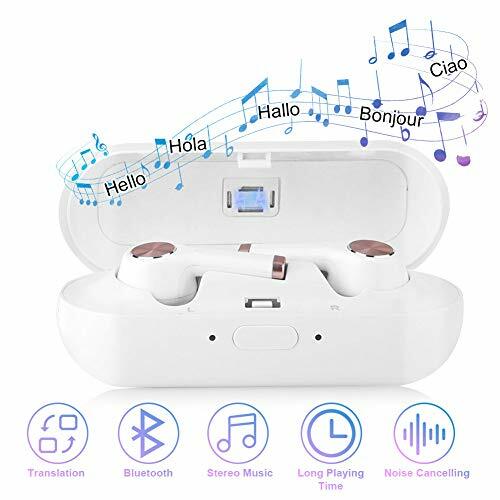 【High Recognition Ability】This Bluetooth Earbuds Voice Translator is accurate and fast for real time translation, widely apply in travelling, hotel consultation, order, communication, studying. MULTIPLE LANGUAGES TRASLATION: Support up to 20 languages translation, such as English, Chinese, Japanese, Spanish, French, Portuguese etc. will update more language soon. Can through app to support business conference calls 5 people in 5 different languages at the same time. HIGH FIDELITY SOUND: Built-in 8mm moving-coil speaker & 30 DB strong anti-microphone head which bring unexpected smooth and clear music to your ears. Only for you better earphone experience. 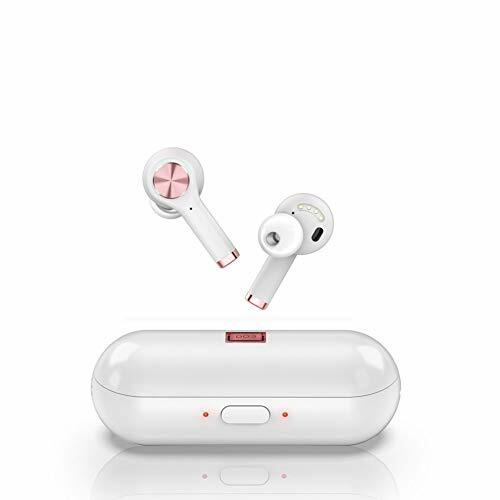 CONVENIENT DESIGN: Optimized Bluetooth 5.0 version allows stable and fast audio transmission, true wireless connection for up to 10 meters, easy to connect to your Bluetooth devices in seconds. Mini and compact, no messy wire and easy to wear, stable and comfortable for driving, running, travel, and other indoor or outdoor activities. 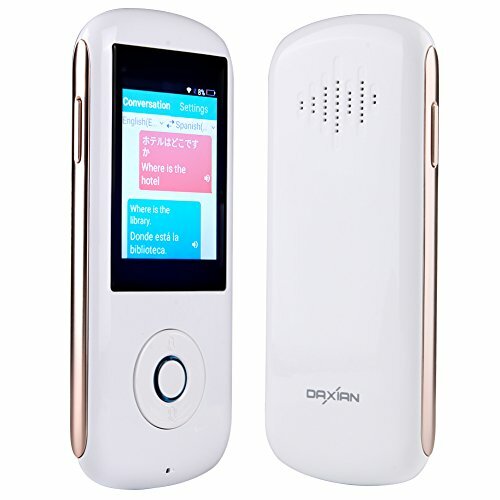 LONG BATTERY: Built in green 100mAh rechargeable lithium battery and protective circuit board, up to 6 hours Continuous talk time with full charged. 12-hour battery life. WARRANTY: If You'Re Not Completely Satisfied With Your Purchase Simply Let Us Know , We will try our best to help you solve. Purchase Today By Clicking The Yellow "Add To Cart Button" Above. ❤ Synchronous translation in 43 languages: German, Chinese, English, Japanese, French, Arabic, Spanish, Russian, Korean, Romanian, Tamil, Greek, Portuguese, Slovak, Catalan, Norwegian, Italian, Finnish, Hungarian, Cantonese, Vietnamese, Bulgarian , Turkish, Hindi, Polish Slovenian, Czech, Hebrew, Taiwanese, Croatian, Swedish, Danish, Dutch, Thai, etc. 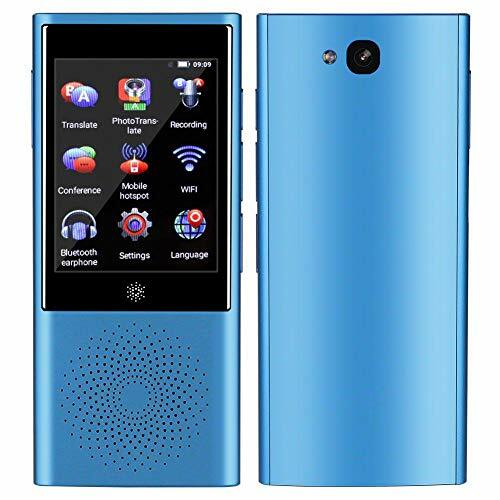 The machine is equipped with Android 6.0 system, built-in 1450mah rechargeable battery, support recording function, support network: Unicom 3G and WIFI, equipped with 2.0-inch full-view HD touch screen, audio output is 3.5mm headphone jack, body memory 5.69G. 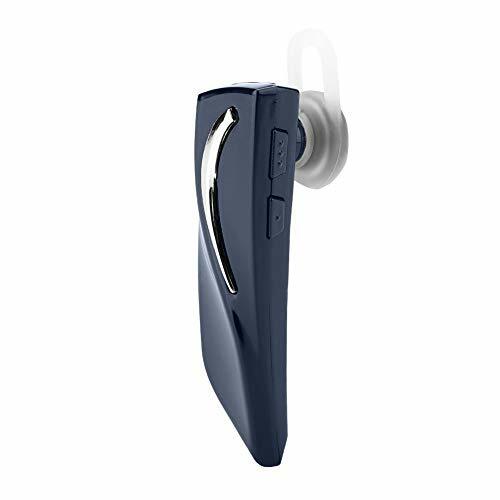 In-ear detection function: the earphone is put into the ear, the music starts to play automatically, and the earphone is taken out from the ear, then the music is paused.Built-in 90mAh rechargeable lithium battery, ensures super endurance, support playing for up to 5-8 hours, talking for up to 4.5 hours. Tap function: When playing Bluetooth music, double-click on the headset (both headphones can be used), play/pause operation, if there is a phone, double-click on the headset (both headphones can be used), can answer/hang up. 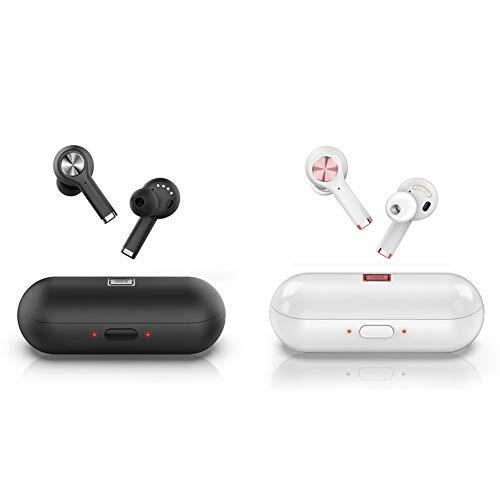 Earphone dual mic noise reduction which allows HiFi audio effect and keeps bass more surging, bring unexpected smooth and clear music to your ears. 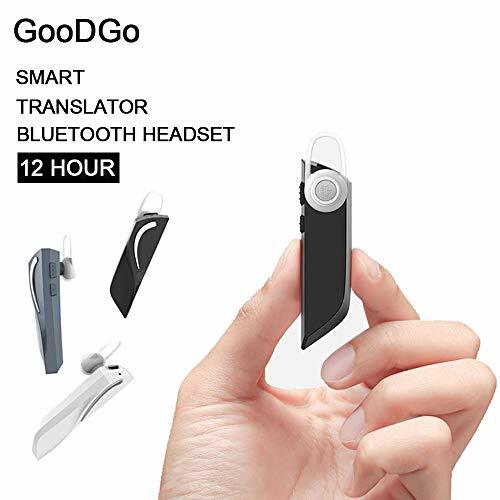 Translator function: combined with Bluetooth headset and mobile APP, can achieve translation function, Bluetooth 5.0 version allows stable and fast audio transmission, true wireless connection for up to 10 meters, easy to connect to your Bluetooth devices in seconds. 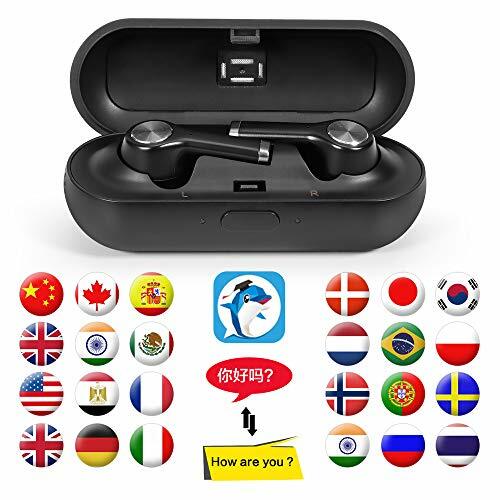 Translation results voice release function: Put the headset into the charging box, then translation results can be released through the charging box.mini and compact, no messy wire and easy to wear, stable and comfortable for driving, running, travel, and other indoor or outdoor activities. Upgraded version: We have updated our Smart language translator to a newer version: 45 languages, recording and Mini function supported. Accuracy of translation improved to 97%, more easy operation. 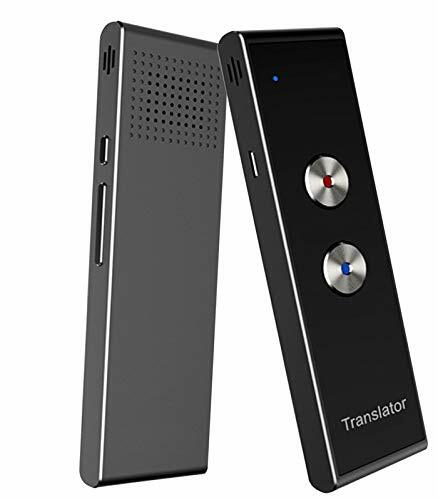 High-speed translating accuracy: 2-way translator with 45 languages. Ultra-high translating accuracy for complicated sentences, ease your cross-countries/language communication in different occasion. Long running time: run for about 8-12 hours, standby time 144 hours, best partner for shopping, travelling, meeting, language learning. Pocket size for easily put in your pocket. 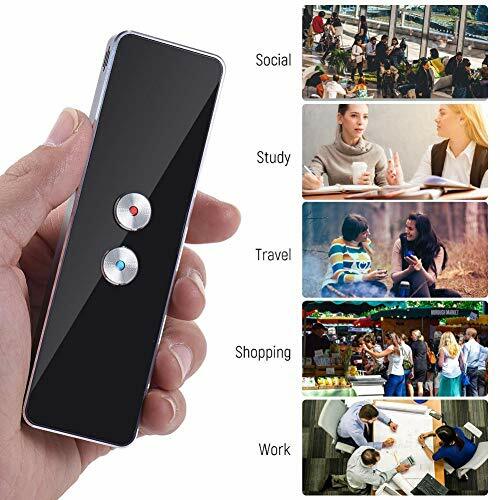 ✪Two-Way Instant Translator---2.4G wireless connection, supports 2-way language translation, designed for language learner, businessmen, tourists, sojourners, etc. 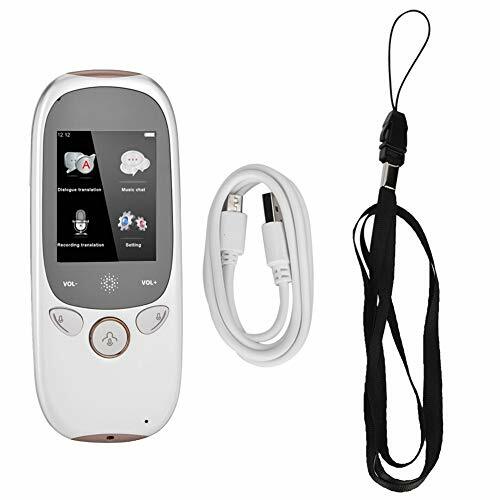 ✪High Recognition Ability & Accuracy---Built-in dual microphone, one is for voice sensing and the other one is for denoising.Lightweight & Strong Battery: Easy to carry, supports long-time use. ✪Easy Operation---Scan the code on the manual and download the app, install it on your Android/ IOS mobile phone, then start to use it. The device must work with the app. For more detail usage, please refer to manual. ✪Wide Compatibility---Compatible with most iOS and Android phones. 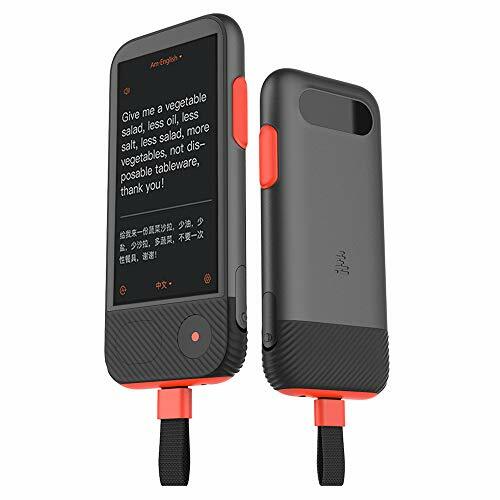 Durable and Rechargeable: Built-in 3.7V 750mA rechargeable battery, low power consumption, plug and easily charge.Handheld size, small and portable, so convenient to carry with wherever you go. 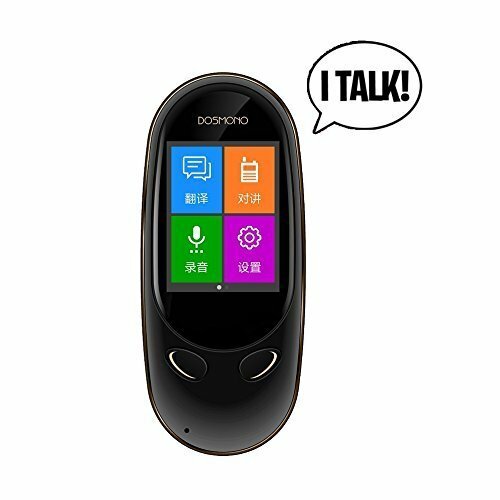 ✪Multiple Portable Languages Translation Device---Support for real-time translation of the following 34 languages: support 33 languages, such as English (US), English (UK), English (Australia), English (India), Simplified Chinese, Cantonese, Traditional Chinese (Taiwan), Korean, Japanese, Thai, French, French (Canada), German, Spanish, Spanish (Mexico), Italian, Dutch, Greek, Portuguese, Portuguese (Brazilian), Russian, Arabic (Egypt), Arabic (Saudi Arabia), Swedish, Czech, Finnish, Danish. 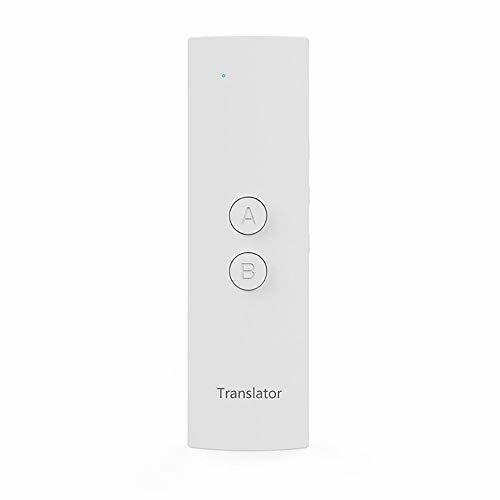 2 WAY TRANSLATION: Allows Two People To Communicate Back And Forth In Their Own Native Languages. ACROSS THE GLOBE: A Person In The U.S. Can Speak To a Person In China in real Time Translation. TRAVEL AROUND THE WORLD: You Will Be Able To Communicate Freely. 80 SUPPORTED LANGUAGES: Partial List, Bangla (Bangladesh), Bangla (India), Cantonese (Hong Kong), Czech, Danish, Dutch, English (Australia), English (India), English (United Kingdom), English (United States), Filipino, Finnish, French, German, Greek, Hindi, Hungarian, Indonesian, Italian, Japanese, Khmer, Korean, Mandarin (China), Mandarin (Taiwan), Nepali, Norwegian, Polish, Portuguese (Brazil), Russian, Sinhala, Spanish (Spain), Spanish (US), Swedish, Thai, Turkish, Ukrainian and Vietnamese.